Tobiano horses have a dominantly inherited white spotting pattern and are one kind of paint. Tobiano (pronounced tow-be-yah-no) spotting is present in many breeds and types, including the Shetland and Australian Stock Horse, but absent from some predominant breeds, such as the Arabian and Thoroughbred. Some breed authorities do not allow the registration of paint horses of any sort. The tobiano spotting pattern is caused by a large chromosomal inversion (you could think of part of the chromosome being the wrong way round). The inversion was only found in tobiano horses. This included horses of diverse genetic backgrounds, indicating a common genetic origin thousands of years ago. The inversion is thought to disrupt a sequence involved in the regulation of the KIT gene (Brooks et al, 2007). KIT is a large complex protein involved in many cell processes. Other KIT mutations cause roan, domiant white, tobiano and sabino. Tobiano horses have a pattern of white hair with underlying pink skin. The tobiano pattern can occur with any coat color. It often occurs in combination with other patterns, for example in the tovero, which is a combination of tobiano and overo spotting. The pattern develops while the foal is still in the womb and remains throughout its life. Sometimes pigmented skin extends just beyond beyond a patch of color, into a white area. This makes it look as if there is a shadow or halo around the color patch, especially when the coat is wet. Horses with such halos are often called shadow paints, ghost paints, ribbons paints or halo paints. Tobiano horses may be either predominantly colored or white, or with a fairly even amount of white and color. They are identified by their white legs and solid colored head, whereas with other horses leg and face markings usually go together. Tobianos do not have extreme facial white, such as aprons or bald faces. 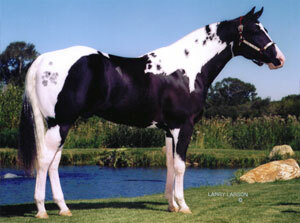 White markings indicate a combination of patterns, or a different pattern, such as sabino, frame overo or splash. 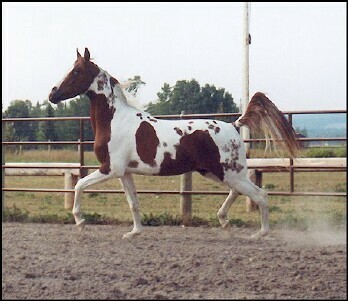 The white on the body is arranged in a vertical pattern, with white extending over the topline somewhere between the ears and tail (the reverse of frame overo). The spots are usually regular and distinct in outline, with ovals or round patterns extending down over the neck and chest. Dark color usually covers the flanks. The color on the flanks and chest are called "shields" and are characteristic of tobiano horses. The absence of these spots indicates that another spotting pattern is present. The tail is often two colors, when it is white at the base end (i.e. the end nearest the tail), and colored at the other end. On some tobiano horses there may be small colored spots, commonly called ink spots, paw prints or cat tracks, in the white patches. These are usually small and round and may occur in groups. This marking often occurs in horses homozygous for the tobiano gene, but isn’t a guarantee that the horse is homozygous. There may also be ermine spots or distal leg spots: spots of color in the white close to the hoof or above the ankle respectively. There may also be color around the chestnuts. Tobiano horses are less common than some may think, most tobiano looking horses are a combination of tobiano and one of the other patterns. This is not surprising since breeders often cross paints together with regard to the phenotype (external appearance) rather than their genetic makeup. 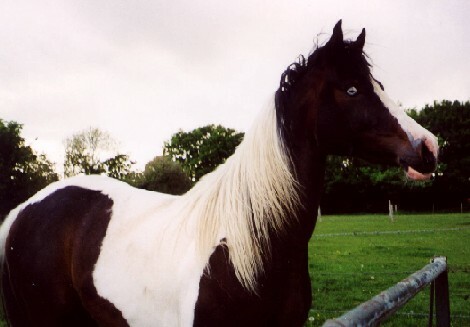 Tobiano can hide the characteristics of the other pattern genes, but extensive white face markings can give away a combinaion. Some tobiano horses have white bodies and colored heads, the heads being the last part of the body remaining colored. These horses are sometimes called medicine hats (Gower, 1999), although others reserve this term for overo patterns. The color round the head is said by some authors to be an adaptation evolved to protect eyes from over-exposure to the sun. This is possible since the trait has probably occurred for some appreciable amount of time (since at least the late 1600’s) in mustang horses. Whatever it might well actually provide some protection for the eyes of tobiano horses. At the other end of the spectrum some tobiano horses do not have any body spots. These minimally marked horses are sometimes called "slipped tobiano". They have white leg markings and, in the absence of other pattern genes, a dark head, and are usually thought to be solid horses with white leg markings. They can, nevertheless, produce tobiano offspring as reliably as any other horse with the tobiano gene. It has been suggested that paint horses with extensive white are usually a combination of patterns, and this may well be the case. However the extent of white is probably also controlled by several (or perhaps many) other modifying genes. Such genes don’t directly cause a pattern to exist, but modify the expression of pattern genes when they do exist, so that different horses with the same pattern genes have more or less white according to which modifying genes are present. It doesn’t seem to be the case that horses homozygous for tobiano have more white than heterozygotes, since very minimal tobianos do occur that test homozygous for tobiano. Genotype testing for tobiano horses involves a combination of phenotype analysis, molecular genetics and pedigree analysis.